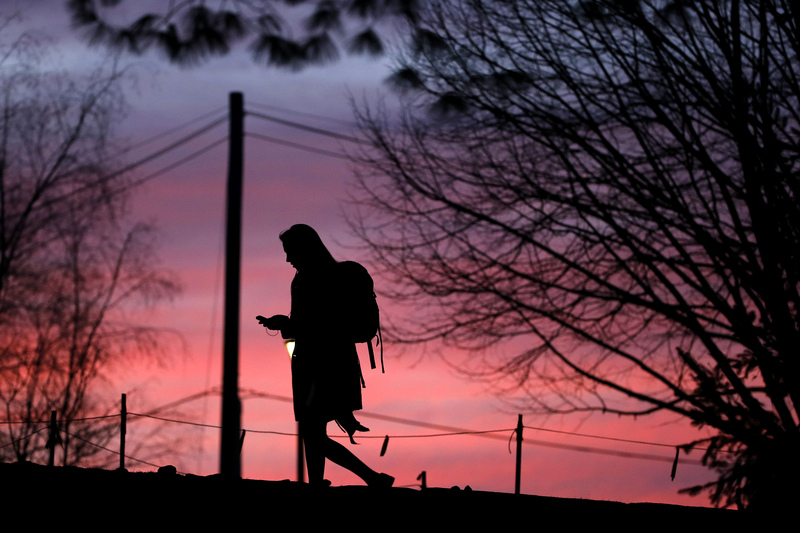 A university student walks across campus as the sun sets, February 4, 2016, in Durham, New Hampshire. Most part-time college students never make it to graduation. The higher education system must do better. Missy Antonio is a 37-year-old full-time mother who balances taking care of her toddler son and 8-year-old daughter with studying for a college degree. Her husband works long hours, so Antonio is often solo chasing after her not-yet 2-year-old from the wee hours of the morning, and getting her daughter off to school and back each day. During nap time and late at night, she studies to keep her grades up to get into the nursing program at her school, the Community College of Baltimore County (CCBC). For Antonio, juggling school and family is complicated at best, and an unexpected circumstance can easily wreak havoc. That is what happened on a recent weekend this spring. Missy had plans to spend Sunday afternoon at the library studying for an anatomy and physiology test coming up that Monday. But then her daughter started vomiting Saturday evening, and Antonio was up all night taking care of her. On Sunday, her husband had to work an overtime shift, and her daughter was still too sick to go to her grandparents. Unable to make it to the library, Antonio instead wound up staying up studying until 3 a.m. Monday. She was able to sleep for just a few hours, then spent all day Monday caring for her toddler; that evening, she showed up for the exam exhausted. “My brain was all over the place,” she recalled later. She got a disappointing C on the exam. That grueling weekend was just another challenging step on a long journey for Antonio to earn a degree as a part-time college student. Thanks in part to several noncredit developmental courses she had to take, Antonio expects it to take about seven years to earn her associate degree in nursing at CCBC, and then one more year to get a bachelor’s degree at a four-year institution through a combined associate-to-bachelor’s program. This is very typical for part-time students: Those who earn an associate degree take an average of more than eight years to do so.3 What is more unusual about Antonio is that she has already made it more than halfway through. A first-generation student, Antonio decided to go to college when she got laid off from a job at an accounting firm where she had worked for a dozen years. Her reasoning for becoming a nurse is practical: She wants to secure a place for herself in the U.S. economy. Low rates of part-time completion are not just bad for individual students who are seeking the opportunities that come with a college degree. The poor degree attainment outcomes of part-time students hold the entire nation back from meeting national educational needs that are key to keeping the United States globally competitive. Policymakers across the country have increasingly recognized the imperative to produce more college graduates in order to build a competitive economy. In fact, the United States needs more than 16 million more people to earn a postsecondary credential by 2025.6 The United States will never hit those targets unless part-time students are offered a more viable path. In this report, the Center for American Progress details what is known about part-time students and their experiences, and explores what still needs to be learned to help them persist on the long road to a college credential. In addition to examining available data, the report shares the specific stories of part-time students at Maryland’s Community College of Baltimore County, a large community college where 7 in 10 students attend part-time. The interviews of part-time students offer insight on why students choose to study part-time, what barriers they face, and what supports help them maintain their educational momentum. As this report makes clear, part-time students are hidden in plain sight—that is to say, that while there is some statistical data about this population, there is much more to learn about part-time students and what supports are needed to improve their prospects in college and beyond. Currently, data at the federal and state level fail to capture their experiences and outcomes. And while there are promising practices around advising and tutoring, accelerated developmental education, adequate financial aid, and child care, there’s limited research specifically focused on how best to serve the part-time student population. To the extent that policies address part-time students at all, it is often to offer incentives to encourage students to attend full-time instead.7 While reaching full-time status is a worthwhile goal for some students who are taking fewer courses than they reasonably could, viable solutions are still needed for students such as Missy Antonio, who cannot realistically take on a full course load. The good news is that new insight about where part-time students are most likely to succeed—or fail—is on the horizon. The federal U.S. Department of Education has begun collecting part-time graduation rates from colleges and universities.8 These data have not yet been made public, but initial numbers are expected to appear later this fall. Once they are available, these figures will allow policymakers and researchers to take simple steps forward— for example, identifying institutions that are especially successful with part-time students and can share best practices with the rest of the field. It is imperative that policymakers and institutional leaders more explicitly include part-time students in their work to improve college completion in the United States. Hopefully, this report and the voices of students like Missy Antonio will inspire new energy and creativity in this arena. A key challenge when looking at part-time students is that “part-time” is an umbrella term encompassing a substantial diversity of experiences. Nearly 60 percent of part-time students attend at least half-time, meaning that they take roughly the equivalent of two courses a semester. Close to 30 percent attend less than half-time, while the rest do a mix of both.13 So the “part-time” label includes the student who is attempting a single course all the way up to a student who is only a credit hour or two shy of the 12-credit course load generally considered a full-time semester. Pierre Tyler, 19, is a first-generation college student who wants to go to medical school or maybe earn a master’s degree in nursing. A 2015 high school graduate, he attracted interest from lacrosse coaches at Division I and Division II colleges, but did not have the grades to get into the schools he wanted. Tyler has the irreverent demeanor of the class clown, but he vows that he is ready to take school seriously. Today he is passionate about trying to instill in the youth football players he coaches what he did not know when he was a kid about the importance of academics. This spring, Tyler was enrolled at CCBC and had a job setting up store displays for Pepsi. The previous summer, he had often been late for his developmental math class because he was working 60 hours a week in the hot months when soda sales were strongest. He took the fall semester off from classes because he did not have the money for tuition, but came back this spring. Tyler expects to be the first in his family to graduate from college. His older brothers have spent time in college, but had to focus on supporting other family members. One helped pay athletics fees for Tyler to play football and lacrosse in high school, and the other had a child of his own right out of high school. Tyler has a keen awareness of how much his family supports him, but it can also feel like a lot of pressure. When the author checked in with Tyler again a few months later, he had decided that working long hours and going to school part-time was not panning-out. He had flunked his spring English class because of poor attendance. “I was taking classes hit-and-miss, and my graduation year got pushed back a year and then another year,” he said. As a result, Tyler has a new plan. Starting in January 2018, he hopes to attend a four-year college full-time. His family agreed to help him enough financially that he could attend school full-time, live on campus, and not work. Tyler has set his sights on a public college in Pennsylvania where he thinks the biology program would be a strong springboard for medical school. He also hopes to play football for the school. “I just decided to do it full-time or nothing,” he said. It is striking how poorly federal data do in answering the key question of how often part-time students finish their studies, especially at the institutional level. 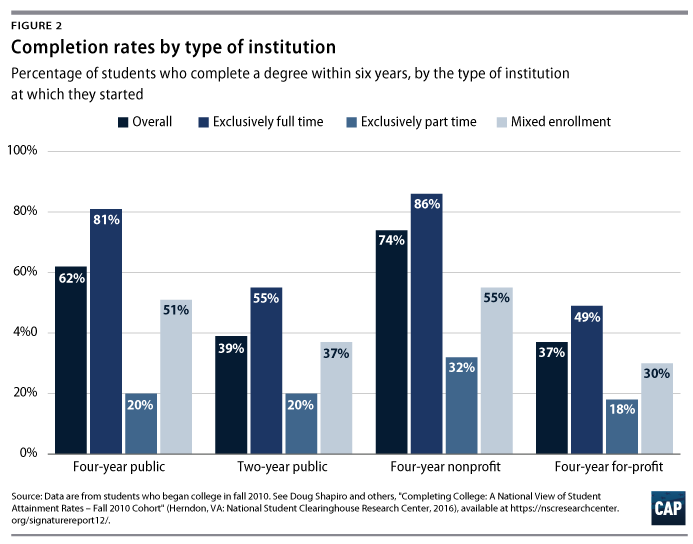 The main federal collection of higher education data from institutions—the Integrated Postsecondary Education Data System—uses a graduation rate that does not include students who start part-time. While new data the U.S. Department of Education plans to release should eventually correct this flaw, these figures have been delayed a few times due to issues with the accuracy of data provided by schools. The most comprehensive and frequently updated data on part-time completion comes from the National Student Clearinghouse Research Center—a private organization in Virginia. It tracks completion rates by attendance intensity and can follow students even when they transfer. However, because the data it holds is proprietary, it does not disclose completion rates by institution. This is an immense shortcoming on a national scale. Every year, hundreds of thousands of part-time students show up at higher education institutions, and data suggest they have at best a 50-50 shot of even being there a year later, let alone graduating. Moreover, a look further down the line at who graduates from college shows that outcomes for part-time students are abysmal. Even with this more limited definition, results for part-time students are still poor. The Clearinghouse data show that only 21 percent of exclusively part-time students who first entered college in 2010 had earned any sort of degree six years later. Seven percent were still enrolled, and the rest—72 percent—had left higher education. By contrast, 75 percent of exclusively full-time students graduated.23 (see Figures 1 and 2) Underrepresented students had even worse odds than their peers. Black and Latino graduation rates of part-time students were around 15 percent, compared to nearly a quarter of white students.24 That mirrors the yawning achievement gap that persists among full-time students. These variations hint at some of what needs to be done to better serve part-time students. There may be certain answers for older students who go to college part-time because they have steady jobs or family caretaking responsibilities. And the solutions might be different for younger students who may not have as many responsibilities and could potentially be convinced to attend full-time with the right advising and support. 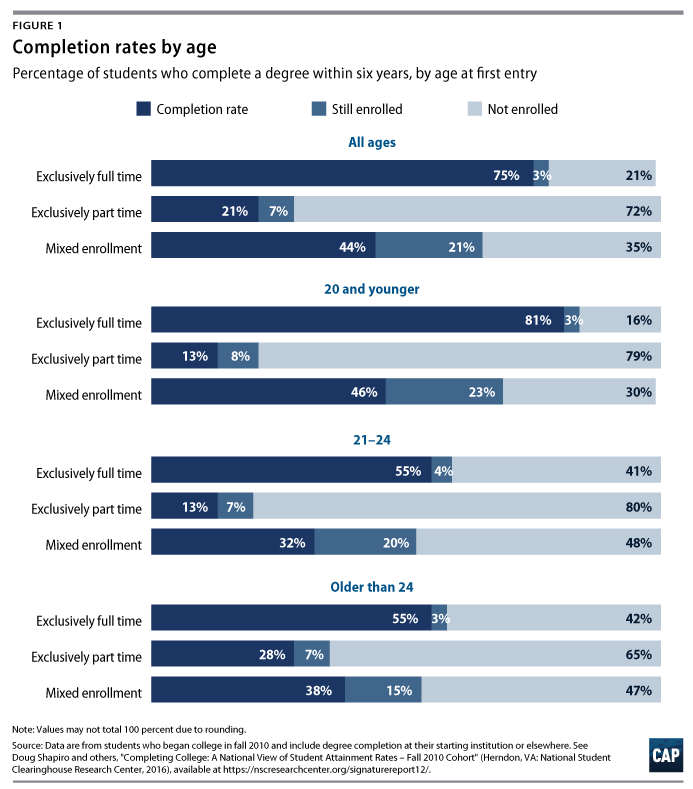 While the discussion so far has focused on students as if they are exclusively part-time or full-time, most of them actually fall into a middle “mixed enrollment” category. These students have at various points spent at least one semester in both a full-time and a part-time status. According to the Clearinghouse, a majority of college students—approximately 54 percent—fall into this category. The viability of a part-time or mixed path likely also depends on factors including the student’s age and employment and whether he or she is a new student or someone who is returning to college after a gap. One study found that a mixed enrollment pattern seems to be a more viable path than full-time enrollment for nonfirst-time students, who are usually adults returning to college. It found these returning students with mixed enrollment histories had similar graduation rates to returning full-time students, and, importantly, were more likely to still be enrolled when the study ended. As a result, their dropout rate was significantly lower than that of full-time returning students.28 As the study’s authors noted, this may suggest that full-time enrollment is not always the right answer for adults balancing school with complicated lives. Ivy Wilson decided to sign up for college for the first time after sending her oldest child off to the University of Maryland. The 36-year-old is a full-time senior-care coordinator in radiation oncology, and she wants to earn a bachelor’s degree so she can become a clinical supervisor. Nine years ago, she took the placement tests but ultimately did not enroll, daunted by the number of remedial classes she would face. This time, she felt ready. And yet, after her first night in English 101, Wilson almost did not go back, intimidated that she was already facing a writing assignment. “I was ready to say, ‘You know what, this just isn’t for me. It’s been too long, I don’t think I’m focused enough,’” she said. But Wilson kept showing up. A one-credit orientation class, which CCBC requires, helped her get comfortable, pointed her to supports that were available, and offered valuable advice. Wilson began emailing first drafts of each of her English assignments to the school’s writing lab, which gives her feedback within 48 hours. By middle of the semester, she was earning an A in the English class and getting great feedback from her professor. “Now I know that I’m more focused now than I was 19 years ago coming right out of high school,” Wilson said. One reason why part-time students may struggle in college is that they are not getting enough financial aid. There may be a misconception in some quarters that part-time students do not need financial aid as much as full-time students because they are, as the logic goes, working their way through school. But that is overly simplistic. For many students, their wages are going toward basic survival. Moreover, time in the classroom, doing homework, studying for exams, or meeting with a tutor, is expensive, because it takes the student away from work or family responsibilities. Students do not just need financial aid to cover their tuition, they may also need to pay a babysitter so they can go to class or study; buy a car to get to campus; or purchase internet service to do their research assignments. It is hard to object when new money is put on the table to help students go to college. But as states confront inevitable budget crunches—as seen recently in Oregon36—there is a danger that new programs for full-time students may crowd out aid for the rest of the student population. Antonio is such an inspiring figure on her campus that she is routinely recruited to speak at orientation sessions. She works five hours a week, for $10 an hour, as a senior mentor in the First Year Experience program, mentoring students and supervising other peer mentors. After Antonio got laid off from her longtime job, she started out at CCBC full-time, but decided that was a bit too much. That became doubly true after the birth of her second child. Still, she started her first anatomy and physiology class just two months after her son was born in November 2015. Antonio’s husband is a superintendent at an environmental cleanup firm, and works grueling overtime hours. Sometimes, dirty dishes are her only sign that he came home to sleep and then left for work again. Fortunately, both sets of grandparents help with babysitting. When possible, Antonio looks to schedule classes that meet on Tuesday and Thursday evenings, because her mother and stepfather do country line dancing on Monday and Wednesday nights. And, on a few occasions when she has been in a pinch for child care, she has taken members of the student life staff up on their offers to watch her son while she takes an exam. Antonio has put off applying for the nursing program, because it will be full-time and entail 12-hour clinical shifts. She needs to find affordable child care, and the campus daycare cannot take her son until he is at least 2 years old and potty-trained. In the meantime, she has taken a few classes that she does not need for her program because she fears stalling out. It is common for both part-time and full-time college students to take credits they do not need, students and administrators say, sometimes because they have trouble scheduling the ones they do need, and sometimes because they do not have good guidance on the best way to plot out their academic path. Even though they are a large proportion of the college population, part-time students have often been relegated to the shadows from a data, research, and policy standpoint. As a result, it is difficult to even identify the bright spots where part-time students are more likely to graduate, let alone figure out what those communities or institutions are doing differently. The effects of this limited knowledge extend to a broader difficulty with policy. For example, many states and policy organizations stress the need to move as many students as possible from part-time to full-time or else build up 30 credits over the course of the year with help from summer and winter sessions. There are certainly some part-time students who can and should be pushed to do that. But a lack of understanding about why students choose to go part-time makes it difficult to figure out which students to encourage in a constructive manner and which are better off attending school part-time. 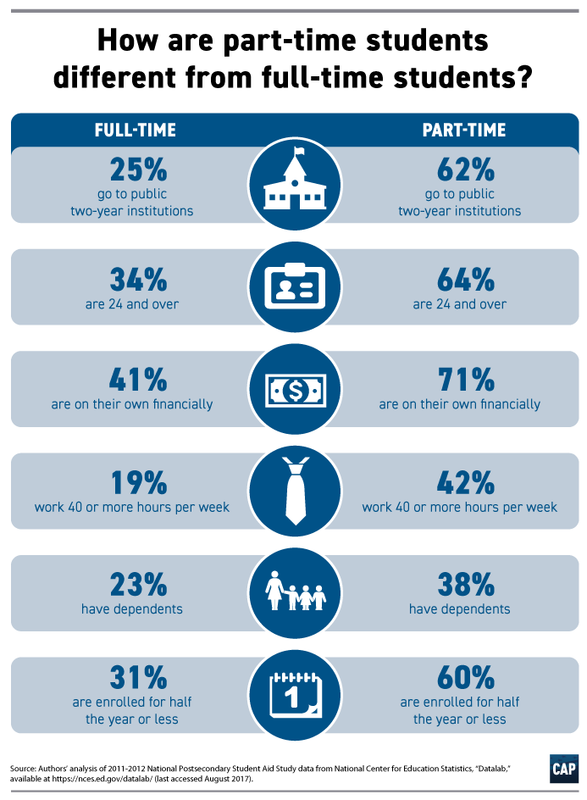 How does part-time student completion vary by college? Is part-time attendance itself the problem or is it a symptom of other obstacles? When is it beneficial to push part-time students to take more credits and when is it not? How do decisions about work hours affect part-time attendance? For even the most basic question about part-time student success, answers are lacking. It remains unknown, for example, how completion rates for this population vary by campus. Currently, the federal government publishes only one measure of outcomes for part-time students: retention rates showing the percentage of students who start college in one fall and return the next. This fall-to-fall lens on college enrollment is especially limiting because nontraditional and community college students do not necessarily follow a traditional academic calendar. As mentioned, researchers are still waiting for federal graduation rate data that include part-time students. And sadly, most state data systems are not much better on this front. A few states, including Texas, Virginia, and Indiana, publish data on the part-time graduation rates of individual institutions. But by and large, there is no way to identify the colleges that are best serving these nontraditional students—or those that are least responsive to their needs. There is one source, however, that does have comprehensive information on part-time completion: the National Student Clearinghouse. Unfortunately, it does not release campus-level data. It does offer state-by-state numbers, and it is certainly instructive to see, for example, that completion rates for exclusively part-time students at community colleges range dramatically—from 11 percent in Mississippi, Idaho, and Oregon to 39 percent in North Dakota.37 But without the ability to dig deeper and identify the institutions contributing to a state’s high or low graduation rate, there’s no way to make sense of these disparities. Nor will part-time students be able to move from Mississippi to the Midwest to get a better shot at graduating part-time. The campus-level part-time graduation rates that the U.S. Department of Education is expected to release sometime this year will offer a vast improvement in the ability to understand these students. However, it has major limitations, just as the existing federal graduation rates do, because it identifies students as part-time based on one moment in time—when they first enter the institution. A student who, for example, attends full-time for only one semester and then spends years as a part-time student will still show up as a full-time student. To truly understand the relationship between enrollment patterns and graduation, federal data need to capture a student’s actual attendance over time. Many education policy experts have called for this “student-level data system.”38 Making it a reality would require Congress to undo a ban on collecting individual-level data passed as part of the Higher Education Act in 2008. Stephanie Praglowski, 20, lives at home with her parents and did not qualify for financial aid, but her parents are not helping her with her tuition. The 2015 high school graduate is an example of what complicated financial lives part-time students can have, even if they are not poor. This spring, Praglowski was taking her first few college classes while working full-time scheduling biopsies in a clinic. She also took out an unsubsidized loan that is building interest even while she is in school. That came on top of the credit card debt she took on when she paid part of her sister’s community college tuition bill last fall. Praglowski shared an update over the summer: She had earned a 4.0 GPA in the spring, had taken several summer classes, and planned to take three classes in the fall, including two that she expected to be very difficult. Is part-time attendance itself the problem or is it the symptom of other obstacles? Students’ lives are complicated and rarely fit into neat categories. This is especially true for part-time students. Many of them are older, working, have children to care for, or face other barriers that tend to impede postsecondary success. This creates a challenge for understanding the extent to which part-time status itself is to blame when a student drops out, and to what extent the life challenges that prompted them to enroll part-time are the problem. To be clear, this question is not meant to suggest that students are at fault for such a widespread problem. Whatever answer stakeholders settle upon, the higher education system needs to support part-time students better. It makes sense that diving in full-time is a better way to get comfortable with campus, get to know classmates and professors who can offer support, and develop an identity that centers around being a college student and working towards a degree. But that does not mean that an entirely or even mostly full-time path can work for every profile of part-time student. Additional research looking at enrollment patterns for particular demographics, such as older students and students with children, would increase the understanding of what level of enrollment intensity works best for these types of nontraditional students. The number of credits students attempt is inextricably linked to whether they will ultimately graduate and how long it will take. In traditional academic programs, students need to complete a minimum number of credits—typically 120 for a bachelor’s degree or 60 for an associate degree—in order to receive a credential. Take only six credits a semester, and that four-year bachelor’s degree becomes a 10-year program. Still, credit load must be part of any conversation about boosting part-time students’ completion rates or speeding up their college career. Ongoing efforts to increase credit accumulation for full-time students could have significant ramifications for part-time attendees. Some part-time students might just need better advising and a clear understanding of the downsides of part-time enrollment. Survey data show that nearly half of part-time students who have been enrolled for two terms think they can get an associate’s degree in just one to two years. 45 This is, of course, very far from reality. There are also many implications for part-time students as policymakers at the state level experiment with ways to improve college completion by boosting the credit loads of students who were already considered full-time. This movement is known as 15 to Finish—the name referring to the number of credits a student must finish each semester in order to stay on track to earn a degree on time.47 In some cases, these policies provide additional benefits for students who commit to taking more courses.48 In other instances, states require students to take a higher course load in order to receive the maximum need-based aid award. To determine whether policies such as Indiana’s have an overall positive impact on students, it is key to understand the downsides as well. For example, by design, Indiana’s policy has losers as well as winners: Students lost their scholarships in higher numbers. The rate at which students renewed their scholarships for a second year dropped 9 percentage points for one of the aid programs in question, and 12 points for the other. It would be useful to know more about these students who end up on the wrong side of the completion push. Do they take on more loans? What happens to their grades? What about their dropout rate? The president of the honor society chapter at CCBC, Lejla Heric-Safadi, 36, is a parent and part-time student who is hoping to transfer to a four-year institution, then apply to Ph.D programs in neuroscience and pursue a research career. This spring, she was taking 11 credits—just shy of full-time—but she had slowly ramped her way up from one credits, to six, and so on. She plans to go back down to seven credits this fall because she had to pick up several shifts working in a restaurant because she needed extra money. Heric-Safadi, who has 10- and 11-year-old children, immigrated four years ago from Bosnia, where her schooling as a child was frequently interrupted by war. She cherishes the American-style education she is getting now, with so many opportunities to ask questions, but feels like she has to work harder than her peers to catch up. Heric-Safadi has an on-campus job as a mentor to other students. And she says the support she has received from professors and tutors has carried her through the many weeks when she feels like she is drowning. One factor that may drive students to limit themselves to part-time study is the need to work. As mentioned earlier, three-quarters of part-time students have jobs, and 42 percent of them work full-time.51 It stands to reason that if they could work less—or were willing to work less—students could devote more hours to classes and make their way through school more quickly. Some of the students had to reduce their loans in exchange for the grant. But that gap might also be because students had so much financial need that extra cash appealed more than a better work schedule. They might have needed the money just to put groceries in the pantry. The authors also note that in an unfavorable job market, students may not have many options to cut back work hours. Some employers demand a set number of hours or keep their workers on call, and it may not be possible or appealing to find a different job with lower hours or more flexibility. Some students pay for college with tuition benefits provided by their employer. Others might appreciate the extra flexibility that spare cash can bring, perhaps allowing them, for example, to hire a babysitter before a big exam. Others yet, including Missy Antonio and Lejla Heric-Safadi, two students interviewed for this report, find a part-time job on campus to be an extremely rewarding way to build connections on campus. Furthermore, those part-time students who have been out of high school for a period of years, or who are financially responsible for family members, often see earning a living as their primary pursuit and paramount duty, and less risky than the distant, uncertain prospect of a college degree. In some cases, a good financial aid package—not to mention the improved earnings that an earlier graduation would afford—would make full-time study the better option. But that is likely a complicated decision for a student and his or her family to make. In the one-credit orientation class required for both full-time and part-time students at CCBC, students are given an assignment where they map out their education plan for the next two years, to help them understand what classes they need, and in what sequence—and how long it will realistically take them to finish. In completing the exercise, LaSha Paschall realized that with her plan to take about six credits a semester, she would only be half done with her degree by 2019. That is despite the fact that this spring she was in class four nights a week, juggling English 101, a noncredit developmental math class, and the orientation class that meets once a week for half the semester. And that is all in addition to her full-time job in a medical clinic. Paschall first enrolled at CCBC eight years ago, right out of high school. At the time, she was not focused on school and quit, but now she wants a career. She is getting adequate financial aid and feels fortunate to have a lot of family support. Her 8-year-old stays with her great-grandmother while Paschall is going to night classes. Still, it is stressful. She feels like she is working all the time. Her daughter is tickled that mom is also in school, and they like doing homework together. But Paschall feels guilty about getting home late and trying to rush her daughter into bed when the little girl wants to talk about her day. When it comes to the conversation about equity and student success in higher education, part-time students cannot stay at the margins. More research is needed on the interaction between student enrollment patterns and their success in college. It is crucial to understand what interventions— whether it is financial aid policy or campus-based measures such as reform of developmental education, so-called intrusive advising, and affordable child care, for example—make the biggest difference for part-time students. When state and federal policymakers design or implement a new initiative, they must consider how it impacts part-time students. And if a policy seeks to encourage full-time study, it is key to know who gets left behind. When community college administrators are asked about what they do to serve their part-time students, they frequently note that the majority of their students are part-time, so everything they do is for part-time students. This is not a satisfying answer. Part-time students face challenges particular to their long journey to a college degree, and the differences in their needs and experiences should be considered. To be sure, the solution for some students is simply to take more courses. There is no question that full-time enrollment is, in a vacuum, a much better option.53 The longer it takes to get through school, the more likely that a family crisis or financial setback will derail a student’s plans. Graduating sooner also means more years to take advantage of the income benefits of a degree. And because part-time students spend less time on campus, they have fewer opportunities to get tutoring or advising, and to build relationships with classmates and professors. But students do not make their college choices in a vacuum. The grocery bills, the rent checks, and the child care duties are day in and day out realities. For lots of part-time students, earning a living and caring for family are paramount obligations long before they enroll in college. Many students find they can swing full-time enrollment for a semester or a year or more. But to attend entirely full-time is not an option. According to a U.S. Department of Education estimate, the part-time student population is expected to grow by 18 percent between 2012 and 2023, compared to 14 percent for full-time students.54 And while it makes sense to encourage full-time enrollment whenever practical, it is not always a viable option. For example, Missy Antonio is not going to go to college full-time with an 8-year-old, a toddler, and no steady child care. Likewise, full-time enrollment is not an option for Ivy Wilson, who has a daughter in college and another in elementary school, and a long-standing full-time job with an employer she feels committed to. It is clear that as a nation we need more answers for students like them. The students profiled in this report are not a representative sample of part-time community college students. Rather, their stories are intended to inspire further reflection on how to help part-time students. All the students were interviewed by the author, Marcella Bombardieri. Missy Antonio and Lejla Heric-Safadi were identified with help from officials at the Community College of Baltimore County. Antonio was interviewed by phone in March 2017 and June 2017, with additional follow-up via emails and text messages in July and August 2017. Heric-Safadi was interviewed by phone in March 2017, and communicated with the author again via email in August 2017. Pierre Tyler, Ivy Wilson, Stephanie Praglowski, and LaSha Paschall were all interviewed in person at CCBC’s Essex campus in Baltimore, Maryland, in March 2017, when the author visited their orientation class, ACDV 101: Transitioning to College. The author attempted to follow-up with each of them in the summer, and communicated with Tyler via phone and text message in July and August 2017, and Praglowski via email in July 2017. The author would like to thank the many students, faculty, and staff members at the Community College of Baltimore County who assisted with this project. Marcella Bombardieri is a senior policy analyst of Postsecondary Education at American Progress. She was previously the education editor at Politico, and spent many years at The Boston Globe, including covering higher education and working on the Spotlight team.